So here’s something you may not know about me: There are few things I love on this good earth as much as Gilmore Girls. And with the A Year in the Life ‘reunion’ season debuting on Netflix this Friday, I’ll be spending the week sharing my thoughts on my Top 20 favorite episodes of the series. Why Top 20? Because when I tried to list just 10 I came up with so many more. Gilmore Girls was a qualitatively consistent show – most episodes are at least very good, and few, even during the show’s rougher patches, are obvious outliers one way or another. Normally, I would try ‘ranking’ a list like this, but I quickly found that to be a foolhardy task. I cannot name my favorite episode among these 20, nor can I easily say any of them are better or worse than one another. So instead, we’ll be revisiting these episodes chronologically, from the very beginning to the very end, in four articles, posting Monday through Thursday, featuring 5 episodes apiece. You can read Part 1 here, covering #1 – 5. Gilmore Girls’ explorations of class and social conflict tended to mostly move along the same path – between Lorelai & Rory’s world and the world of Lorelai’s parents – but in “That Damn Donna Reed,” the show examines a more Stars-Hollow-centric social divide, with a story about Rory reconciling how she’s perhaps taken for granted the way she’s been raised. The conflict at the heart of the episode – that Dean, who grew up with a stay-at-home-Mom, doesn’t understand why Rory and Lorelai find the Donna Reed show so funny – is an interesting one. It’s far from didactic – at no point does the show insinuate Dean is being genuinely or purposefully sexist, and neither does it negate any of Rory and Lorelai’s commendable independence – and it makes one think about this complex issue in an unexpected way. Rory dressing up as Donna Reed and making Dean dinner is a story beat that could go so easily awry, but it’s a testament to the writing and Alexis Bledel and Jared Padalecki’s performances (of all Rory’s boyfriends, I think she had the best in-relationship chemistry with Dean) that it comes across as sweet, a way to defuse the tension without either side being discredited. The rest of the episode is strong as well, with a great early Luke/Lorelai story in which she convinces him to let her help repaint the diner, and a very funny subplot that intersects with both of the other stories, in which Rory has to care for a baby chick as a school project. It’s just a very strong, entertaining episode all around, and one that pushes the show’s fascination with pop culture and dissection in social strata in truly fascinating directions. Was it ever a good idea to put Lorelai in an engagement with Max Medina? Scott Cohen had great, easy chemistry with Lauren Graham, and the relationship itself was a strong part of the first season, but even if the proposal made for one of the series’ more memorable moments – Max filling the lobby of the Independence Inn with sunflowers – the engagement itself was obviously doomed, given how much time the first season invested in the idea of Luke and Lorelai being (slightly clueless) soulmates. But if the engagement’s demise was inevitable, and if the way the show got out of it early in the second season felt a bit rote (Max and Lorelai are engaged for a total of three episodes), “The Road Trip to Harvard” is a pretty spectacular bit of pay-off. Lorelai works out her post-break-up grief by taking Rory on an impromptu road trip, and while the eventual destination is Harvard (Rory’s dream school right up until the moment the show realized they couldn’t send the character off to another state), the episode itself has this wonderful aimless quality to it, with different stops along the way and a wonderfully bizarre extended sequence at a strange bed and breakfast. And even if Rory never wound up going to Harvard (not that Yale is a substitute to sneeze at), that doesn’t negate the emotions of the visit itself, with Rory immediately falling in love with collegiate academics and Lorelai realizing, with pride, how worth it all their hard work will have been to get Rory to a place like this. Just a great Lorelai & Rory story all around, and easily one of the highlights of the show’s second season. Here’s an episode where I almost feel compelled to just summarize every wonderful, silly, observant thing that happens in it, because it’s practically bursting with great comedy and excellent character moments. Rory and Lorelai are told by Headmaster Charleston that they need to become more involved in Chilton’s social life, which leads mother and daughter to go down two seemingly innocuous paths that turn into surreal adventures. Rory sits at the ‘cool girls’ table, only to learn from Paris that she was inadvertently inducted into ‘The Puffs,’ an old underground Chilton sorority; while Lorelai, meanwhile, is pressured into joining the Boosters, only to discover that they are planning fundraising fashion show that Lorelai will have to take part in as model. Not that spoilers matter much for a show like Gilmore Girls, but I won’t say too much about where the story goes from there, because it’s just a blast to watch no matter how many times I see it. The highlight is probably Lorelai getting back at Emily (who pressured her into becoming a Booster) by making her partake in a mother/daughter-themed part of the fashion show. 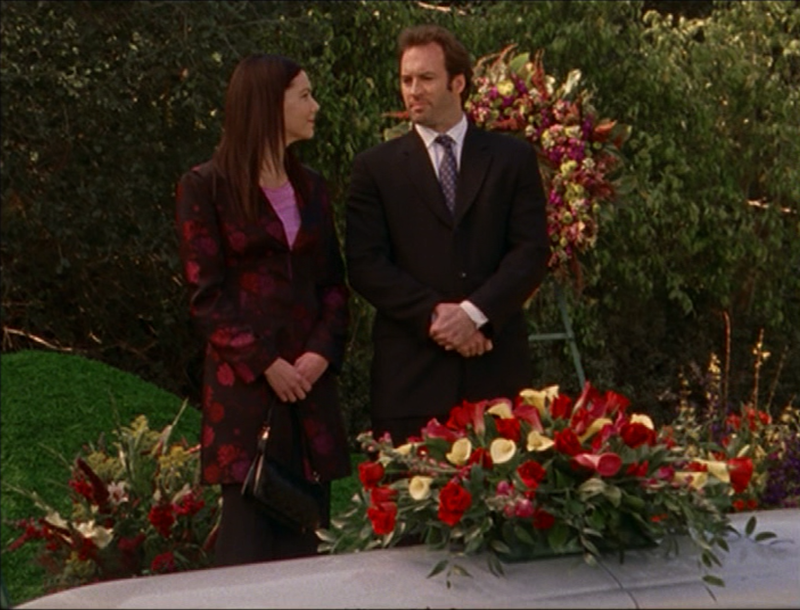 The episode is obviously funny, suffice it to say, but like the best Gilmore Girls outings, this one also has its finger square on the thematic pulse of the series, offering another great hour about mother and daughter (in this case, both pairs of Gilmore mothers and daughters) going through similar experiences at different ages. It’s one in a number of stories about how, when raising a kid, one inevitably winds up repeating certain experiences from youth (the episode takes special care to make the Boosters seem just as ridiculous as the Puffs), and is certainly one of the most clever approaches the show took to telling that archetypal narrative. First, I love how the title for this episode sounds like someone on the writing staff forgot to give it a name until the very last minute, looked over the script, and gave a simple, descriptive title of the episode’s most basic narrative content. Love it. Second, this is one of the best Luke-centric hours in the series, one that not only perfectly encapsulates the two sides of his personality – the curmudgeon without and the sensitive, selfless guy within – but makes it crystal clear that one is a wounded mask worn over the other. The A-plot involves Luke having to plan the funeral for his despised Uncle Louie, something he promised to do for his late father, only to find that no one in his extended family or in the town wants anything to do with Louie’s memorial. Lorelai steps into help, and it leads to one of the best acting duets Lauren Graham and Scott Patterson ever got to do together (and some fine comedy – Lorelai making up crazy names for mundane food items while helping run the diner is one of my favorite Gilmore Girls gags). In many ways, this episode is a complement to the first season’s “Love and War and Snow,” which I wrote about yesterday, in that it involves Luke’s relationship with various town elders (Taylor and the war reenactors initially refuse to perform the traditional ceremony at Louie’s wedding), with a similar ending (this time, it’s Taylor and company who finally come through for Luke).There are some other really good subplots at work here, including Emily inserting herself into Sookie’s wedding preparations (a pairing we almost never saw) and Taylor lashing out at a local farmer’s market. But it’s the central Luke story that makes this such a great, memorable outing, and as one of Scott Patterson’s standout hours, it deserves a spot on this list. If I were ranking these 20 episodes by ‘quality,’ rather than listing them chronologically, this one would be at or near the very top. It is just so emblematic of the series at its best, revolving around a very silly town tradition – in this case, a 24-hour dance competition, for which the only prize is a comically large trophy – but with the entire extended Stars Hollow ensemble taking it all deadly seriously. Part of what makes Gilmore Girls special is that the main character isn’t an outsider to these oddball traditions; Lorelai is every bit as invested – perhaps moreso – than anyone else in winning this ridiculous competition, and whenever she gets to fully dive into the craziest aspects of Stars Hollow, Lauren Graham has a preposterous amount of fun. Of course, this one has a pretty strong emotional core as well, not just telling a good mother/daughter story – Lorelai winds up drafting Rory to be her dancing partner after her initial choice flakes for hilariously awkward reasons – but also contrasting a fairly down-to-earth Rory plotline with Lorelai’s over-the-top shenanigans. This is the episode where Dean breaks up with Rory for good (well, sort of…until that period where they have an affair in Seasons 4 and 5) over jealousy from Jess (who continued to have smoldering chemistry with Rory right up until the moment they were actually a couple). 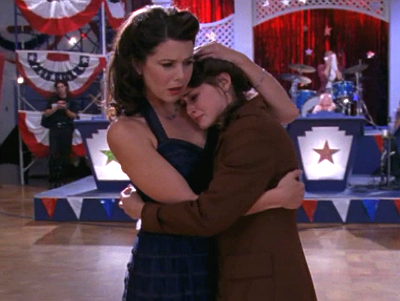 It’s not so much the Dean/Jess story that gives the episode weight as Lorelai’s reaction to it at the hour’s climax, her initial frustration over Rory abandoning the dance giving way to immediate comfort, in a shot so good – Lorelai hugging Rory on the abandoned dance floor – that it would be used in the theme song for years to come. Just a terrific, wildly entertaining hour that ends with the kind of wallop Gilmore Girls could so effortlessly deliver during the initial high-school seasons. Come back tomorrow as our journey through the finest hours of Gilmore Girls continues, with #11 - #15 on the Top 20, and throughout the week as we prepare to welcome this wonderful series back into our lives.